VOLCANO BOOK FOR KIDS! A VOLCANIC ADVENTURE! Veronica is a perfectly ordinary girl, except for one very important thing–she lives on a volcano! Join Veronica on her search for pearls in the black sands on the far side of the biggest volcano of all … Mount Mystery! Veronica sets off in the “lava car” with her best friend, Maddy, and their dads. Together, they must cross Magma Pass, hike through the Cinnamon Forest, and brave the poisonous Yellow Lake to get to the base of Mount Mystery, where the true test begins. The base of Mount Mystery is a moonscape pocked with craters the size of school buses. Here the earth pulses with power: geysers steam, mud pots boil, and stones smoke like ghosts in the spectral fog. Yet they press on through the war-zone landscape to the summit, where they are faced with an impossible choice: of life and death, of bad and worse. Veronica makes her decision, and the world falls into darkness. Yet amid total despair and with the help of her family and friends, she discovers a map that can change the world, if only someone didn’t stand in her way–the man in white! Join Veronica on this epic, middle-grade adventure of eruption, pirates, and volcanic winter. Includes dozens of the most beautiful volcanic illustrations in print today. 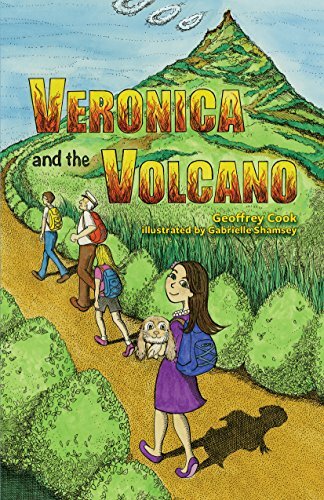 Perfect for volcano lovers of all ages and especially girls ages 9 to 12. Veronica and the Volcano complements STEM (science, technology, engineering, math) curriculum by introducing girls to the excitement of scientific discovery and captivating their natural wonder to inspire them to delve deeper. The book includes a glossary of volcanic and scientific terms. If you liked Kelly Barnhill’s The Girl Who Drank the Moon or The Witch’s Boy or Neil Gaiman’s Coraline or The Graveyard Book, you will love Veronica and the Volcano.